Apple to Extend iTunes Song Previews to 90 Seconds in U.S. According to Symphonic Distribution, Apple has informed music labels that it is preparing to extend the length of iTunes Store song previews in the United States to 90 seconds for songs that are at least 2 minutes and 30 seconds long. Shorter songs will continue to offer the current 30-second samples. 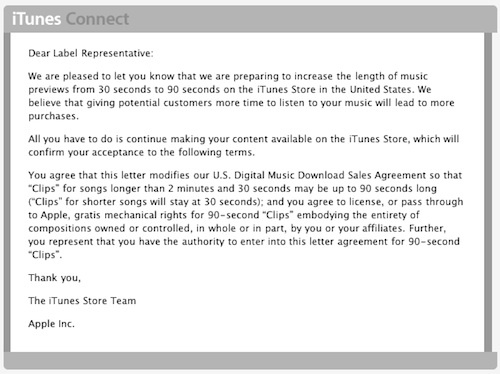 Apple's email notes that by continuing to offer their music on the iTunes Store, labels are indicating their acceptance of the new terms. Consequently, any labels who do not wish to agree with the terms must withdraw their music from the iTunes Store. CNET had reported just two days before Apple's music-focused media event on September 1st that such a change was coming, but it failed to materialize at the event. In a follow-up article, CNET later discovered that the change had been held up by licensing issues, which appear to have now been resolved.